HTTPS site conversion news and info is rolling out at a blistering speed! Most of it is confusing, misleading, or downright bad advice for both site owners, designers, and webmasters alike. Plus, I’m already seeing changes at hosts that actually put your http site at risk. Learning about all this stuff is no longer something you can put off. But it seems too techie and daunting, right? I’m running two, free webinars to help you get up to speed quickly. The first webinar is for site owners. The second webinar is for designers and webmasters. You can register for both, if you like too!! It will help you collect all the info for site elements and accounts that may be affected prior to doing the conversion. 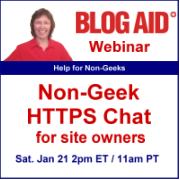 Join me for a free, fun, non-geek-speak chat on what’s up with converting your site to HTTPS and about SSL certificates. I’m going to make it easy for you to cut through the confusing, misleading, and downright bad info floating around about it too. You’ll hear everyday language and analogies that will help you instantly relate to the concepts. We’ll have an open Q&A so you can ask questions too! This is THE most in-demand skill for designers in 2017. 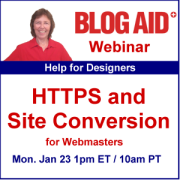 Get up to speed with what it takes to properly convert a site to HTTPS. Anyone who sets up or caretakes sites for a living cannot afford to miss this free webinar. See you at the webinars! Our users will have access to the site without passwords. We sell nothing and so take no credit card details. Am I correct in thinking that we do not need https? Hi Lin, under those conditions, http sites will still pass muster with Chrome for this upcoming rollout on Jan 31st. But the next update will pop all non https sites if the visitor is using an incognito window. It’s not likely that most of your visitors do, so you might be able to skate by. But, before it’s all over, Chrome will pop up a warning for all non https sites, period. Plus, hosts are now being proactive and taking measures to make it “easy” for clients to flip that’s actually causing a ton of issues. So, you’ll have to flip at some point, and the sooner the better. Thanks for your comment, MaAnna. You are absolutely right when you say it seems too techie and very daunting . But I am sure the webinar will shed a lot of light on the topic and help me to first of all understand what is happening and then execute a plan.